We are one of the leading manufacturer, supplier & exporter of Electrochemical Instruments. We are the leading manufacturers and exporter of Lab pH Meter and our product is made of good quality. The equipment is manufactured with the best in class materials available in the market and so clients can use these meters without any concern. This product has been tried and tested and their authenticity has been ascertained many a time. pH , mV and Temperature measurement. Bi directional RS-232 interface. Baud rate selectable from 1200,2400,4800 and 9600. Single and continuous print out of measuring parameters. Multiple Printout types. Combinations selectable from Sr. No., pH, mV, Date, time and temperature. Calibration report as per GLP requirements. Electrode Slope and mV offset display. Memory storage of 100 measurements. Data logging facility up to 500 results. Data logging interval selectable from 5S, 10S, 20S, 30S, 1M, 2M and 5M. Temperature calibration with respect to the solution of known temperature. 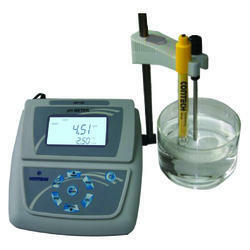 We are the leading manufacturers and exporter of Conductivity Meter and our product is made of good quality. 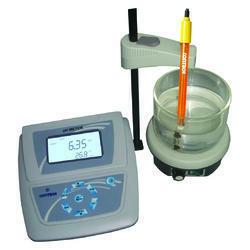 Our conductivity meter is available in various sizes as per customer requirements. This conductivity meter is manufactured utilizing supreme grade material and cutting edge technology in synchronization with set norms of quality by our professionals. The Conductivity Meter that we offer is the best in the market and clients can expect the best service from it for a really long time. Being one of the most important laboratory instruments it is made flawless from every perspective. 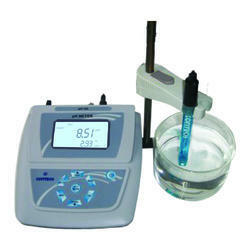 This product is generally used to measure the temperature, salinity, resistivity, and conductivity in solutions. Conductivity, resistivity, total dissolved solids(TDS), salinity & temperature measurement. 1 point calibration for the entire range. Bi directional RS232 interface. Baud rate selectable from 1200, 2400, 4800 and 9600. Single and continuous print out of readings. Multiple Printout types. Combinations selectable from different measuring units. Real Time Clock. Calibration report as per GLP requirements. We are the leading manufacturers and exporter of Dissolved Oxygen Meter and our product is made of good quality. The product has been manufactured in such a way that it is able to deliver the most accurate reading under all circumstances. Dissolved oxygen and temperature measurement. Polarographic type DO electrode offers short polarization time, quick response and precise measurements. Easy to use electrode calibration sets and diaphragm cap. Dissolved oxygen electrode with the salinity measurement feature to achieve automatic salinity & temperature compensation. Automatic air pressure correction with the help of air pressure sensor. Bi directional RS232 interface. Baud rate selectable from 1200,2400,4800 and 9600. Multiple Printout types. Combinations selectable from different measuring parameters. Memory storage of 100 test results. Supplied with Magnetic Stirrer MS-01 as standard. We are the leading manufacturers and exporter of ORP Meter and our product is made of good quality. Single and continuous print out of pH/Rel.mV. Multiple Printout types. Combinations selectable from Sr. No., pH, Rel.mV, Date, time and temperature. Data logging facility up to 500 results. Data logging interval selectable from 5S, 10S, the 20s, 30S, 1M, 2M, and 5M. Display LCD display with Backlight. 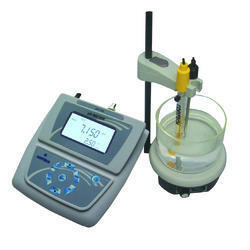 We are the leading manufacturers and exporter of Ion Concentration Meter and our product is made of good quality. The Ion Concentration Meter that we offer is specially designed for laboratory testing purposes, though they can also be used outdoors. Concentration unit mv & temperature measurement. Multiple Printout types. Combinations selectable from Sr. No., concentration unit, mV and temperature. Data logging facility up to 500 results. Data logging interval selectable from 5S, 10S, 20S, 30S, 1M, 2M and 5M. Temperature calibration with respect to solution of known temperature. Display type LCD with Backlight. We are the leading manufacturers and exporter of Multiparameter Meter and our product is made of good quality. Offered meter is manufactured by using optimum grade component and the latest techniques by our skilled professionals. This meter is high on demand in the industry due to its fine finish. pH , mV, Conductivity, Resistivity, TDS, Salinity, DO, Ion Concentration,Temperature modes. Automatic or Manual temperature Compensation. 3 point pH calibration. Buffers selectable from 1.68pH, 4.00pH, 4.01pH, 6.86pH, 7.00pH, 9.18pH,9.20pH. 10.01pH and 12.45pH Automatic buffer recognition. 1 point conductivity calibration for the entire range. Dissolved oxygen electrode with the salinity measurement feature to achieve automatic salinity & temperature compensation. Automatic air pressure compensation for DO with the help of air pressure sensor. Polarographic type DO electrode offers short polarization time, quick response and precise measurements. 2 points Ion concentration standard solution calibration. Switching option among 3 measurement units of Ion concentration, pX, mg/L, ppm. Bi directional RS-232 interface. Baud rate selectable from 1200,2400,4800and 9600. Single and continuous print out of measuring parameters. Multiple Printout types. Combinations selectable from Sr. No., pH, mV, conductivity, TDS, Salinity, DO, Ion Concentration, Date, time and temperature. Electrode Slope and mV offset display. LCD display with Backlight. Memory storage of 100 measurements. Data logging facility up to 500 results. Data logging interval selectable from 5S, 10S, 20S, 30S, 1M, 2M and 5M. Temperature calibration with respect to the solution of known temperature. Looking for Electro Chemical Instruments ?